The need for government, organisations and individuals to articulate programmes that would encourage and support kids who are talented in different sports has been emphasised. 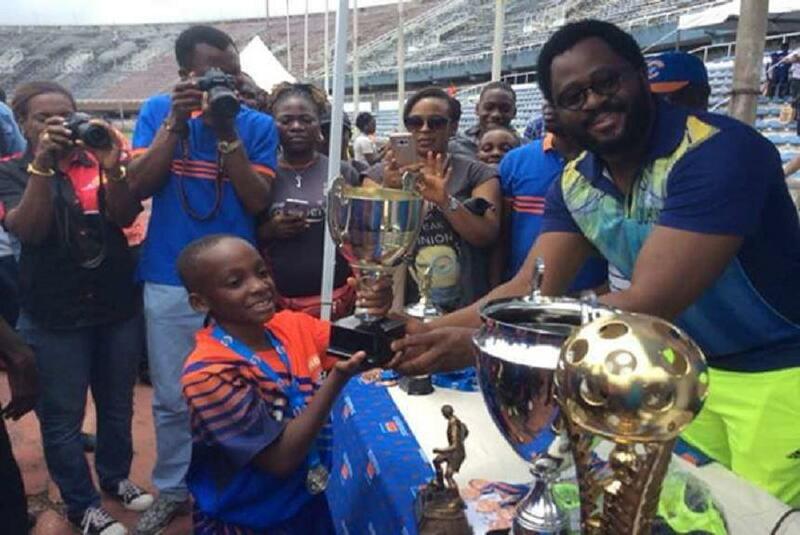 Popular actor and member of the Lagos State House of Assembly, Desmond Elliot, said this would go a long way to making the society a better place. Mr Elliot, who was at the closing ceremony of this year’s Cowbell Football Academy Summer Camp held at the National Stadium, Surulere, Lagos penultimate Saturday, commended Promasidor for its commitment towards developing young sports talents, calling on other private sector players to emulate the company and show sufficient support to the growth of the country’s sports. The three-week camp, which is sponsored by Cowbell milk, the flagship brand of Promasidor Nigeria Limited, drew participation from young football talents between 4 and 18 years of age in different parts of Lagos and beyond. Mr Elliot said Promasidor deserved honour for playing a lead role in the development of football talents through the sponsorship of Cowbell Football Academy. The lawmaker, representing Surulere 1 constituency at the congress, stated that Nigeria could not grow its sports sector unless it made deliberate attempts to develop its young talents at their tender age. “We need to realise that government cannot do everything. What is required is an enabling environment to encourage programmes such as Cowbell Football Academy. Initiatives like this do not only encourage young talents but also keep them healthy. “I encourage other corporate organisations to emulate what Promasidor is doing. The company has been doing this for years. It deserves an award,” he said. Also at the event, Executive Chairman of Lagos State Sports Council, Dr Kweku Tandoh, noted that Nigeria could only leverage the developmental benefits of sports by taking the sector to the grassroots and the schools. He said Cowbell Football Academy had, over the years, demonstrated how young talents could be nurtured. On his part, former President of the Athletes Federation of Nigeria (AFN), Mr Toni Urhobo, said that Nigeria had not been able to get its sports development right because it failed to pay attention to grassroots development. “It is at the academy level that we can get the best trainers in sports. Sports is the biggest employer of labour but we must do it right. It is cheaper to invest in local academies than to source ready-made talents abroad. So, we commend Promasidor for its commitment in this regard,” Mr Urhobo pointed out. Founder of Brila FM, Mr Larry Izamoje, also called on the private sector players to support the government in sports development. He said the first 10 years of great talents are crucial to their success. “Rather than allowing them fall prey to the vices that will destroy them in future, we should focus on catching them young and teach them the right things. What Cowbell Football Academy is currently doing will be harvested by the country in future. It will increase the fortunes of families and boost the country’s foreign exchange earnings,” Mr Izamoje stressed. Earlier, Managing Director of Promasidor, Mr Anders Einarsson, had said that the company was committed to the future of Nigeria’s youths through the academy and its other youth-targeted corporate social responsibilities. Mr Einarson, who was represented by the company’s Marketing Manager, Mr Abiodun Ayodeji, further said: “When we started the summer camp, our goal was to create a platform that would positively engage the youth during the long holidays and help them see life outside the walls of the school from a stimulating and rewarding perspective. We also wanted to expose the kids to the benefits of a healthy lifestyle, which is part of the brand identities of Cowbell.